This is a recent update/adaptation of Future Sight – the card, not the expansion – and is used in some of the same ways. It can fuel some interesting combos and chains, especially if you have any other cards which exile cards from your library and let you play them. It may shut off playing cards from your hand, but if you have a number of cards with alternate uses or ways to cast them – cycling and madness come to mind – that’s not such a big problem. 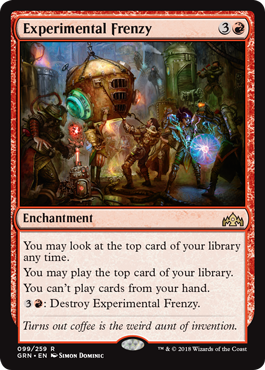 And, of course, if most of your cards are cheap direct damage spells, you can often chain them off the top of your library regardless of how many cards you do or don’t have in your hand.